You will not be prepared for this story. You may think, as I did, that having read North American Lake Monsters, you'll have an inkling about what to expect from Nathan Ballingrud. But, like me, you will be wrong in this assumption. This is an author who strives to challenge us with each new offering, all the while employing a unique blend of visceral imagery and quiet, creeping dread. Perhaps there is no truer testament to that than his latest work, The Visible Filth. Being deeply impressed with Ballingrud's debut, I did not hesitate to order this chapbook from Michael Wilson's This is Horror. And I must confess: even if I weren't familiar with Ballingrud, I likely would have purchased it anyway solely based on the artwork. Artist Pye Parr has done a wonderful job with minimal use of color. It's a haunting image to look at, regardless of its connection to the story. The novella's main character, Will, works as a bartender at a dive in uptown New Orleans. He's a listless fellow, sharing an apartment with a woman he doesn't love and generally going through life on autopilot. Despite a rather active social life, Will appears emotionally isolated; his only joy stemming from an intense affection he has for Alicia, an old friend and frequent patron of the bar. As luck would have it, however, she is already in a relationship, leaving Will with the burden of a love that can only ever exist as one-sided. The characters are well-defined and relatable, so of course Ballingrud wastes no time leading them straight into hell. A bloody confrontation occurs at the bar one evening, causing Will to discover a smartphone left behind by a college student involved in the brawl. He takes it home for the night, keeping it safe with the intention of returning it to its owner. Only, someone begins sending disturbing text messages to the phone. Not long after that, things much worse than messages begin to arrive; things that eventually lead Will and the people in his life to a conclusion that will leave your jaw fixed solidly to the floor. Ballingrud has a gift for creating damaged characters. Put another way: he is exceptionally versed at showing us who we truly are. His fiction often serves as a mirror, allowing us to see the dirt and grime coating what we’d always thought was so pure. While reading The Visible Filth, you will find yourself sympathizing with the very worst facets of his characters, and you will feel ashamed for doing this. Yet, there will be another part of you that revels in that shame, a part that is intrigued and made more complete for feeling it. The reason for this is simple: Ballingrud populates his stories with us: men and women plagued by strange emotional disturbances, endlessly striving for connection where there may be none. We are merely insects making our way in the dark, forever seeking refuge from the light. 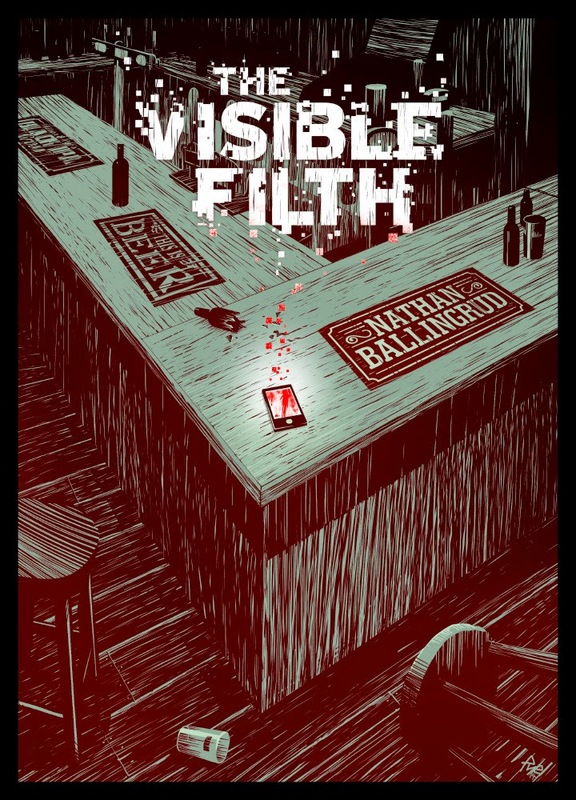 In this effective novella, Nathan Ballingrud shows us the filth inside each of us. He opens us up, allowing the grime to spill outward like a billowing nest of roaches. He strips the paint from our walls to reveal what's been crawling underneath, squirming and skittering and hissing ever so softly. I have noticed some other reviewers voicing dissatisfaction with Ballingrud's use of ambiguity in this story. They appear to feel let-down that certain aspects of the narrative are implied rather than unequivocally presented to them. While I respect that opinion, I wholeheartedly disagree with it. As stated above, I believe the strength of Ballingrud's fiction to be his ability to meld the subtle with the violent and visceral, a blend that gives his work a distinct and unique texture. I applaud authors who don't reveal every aspect of a story, trusting instead in the reader's ability to formulate their own conclusions. I firmly believe the things you don't see are often more terrifying than the things you do.